Berries are most often seen in jams and yogurts with the occasional summer puddings still being made but really most of the general public are not receiving enough of the benefits of these powerful little food items and we should all be making more effort to try and introduce them to a normal diet, even to young children who will benefit in the long term. The high levels of vitamin C and other antioxidants found in blackcurrants should give us enough evidence to want to eat as many of these little berries as possible. They have been found to really extremely beneficial to health both physically and mentally. They slow the signs of ageing of the brain. Help improve cardiac function and the health of the veins and arteries and also are excellent for the health of the urinary system. Strawberries are now regarded as one of the healthiest fruits that can be eaten. They are full of goodness and help protect the heart from long term damage, have anti-inflammatory properties and help prevent some types of cancer.The anti-inflammatory effects can be very beneficial for those with arthritis or other problems of the musculoskeletal system or as a preventative measure for those who are likely to develop in the future. They have shown to be potentially very good at protecting against cancers of the breast, gullet, cervix and tongue and also help reduce the signs of ageing in the brain. Hailed in the press as something of a ‘superfood’, the tiny blueberry has now become one of the most popular berries eaten today. 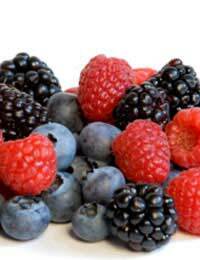 They are packed with antioxidants that have many benefits to health. As the human body ages it produces more of the harmful substances known as free-radicals, the high level of anti-oxidants found in blueberries help fight these free-radicals away protecting us from damage and illness. They are also thought to help protect against cancer and fight the signs of ageing. Another benefit of blueberries is their function on the brain. They have been found to improve balance and help boost memory power by a considerable amount. Most women are now aware of how the cranberry can help keep urine infections away and doctors are now recommending the use of cranberries sometimes over the use of traditional medication, especially as a preventative measure. The substances found in cranberries coat the internal bladder wall with a protective layer then inhibits bacteria from sticking to it and multiplying which is what causes an infection to develop. Cranberries are also very good for the prevention of kidney stones, dental decay and gum disease.They really should be eaten raw to receive the highest level of benefit, but as they can trend to be a bit bitter, it may be better to blend them and add them to a jug of fresh fruit juice. These are just a few of the berries that have been found to be good for our health and we should be making an effort to eat them regularly and encourage our children to enjoy them also. Fruit salads and smoothies are very popular ways of getting them into a child’s diet but as they contain lots of natural sugars, strict attention should be paid to dental health and hygiene also. Most berries are highly coloured which can be very attractive to children so finding ways of including them in the diet should not be too problematic for most parents.